Whether you are an owner of a supermarket or a convenience store, the first and foremost thing you as a business owner have to realize is the importance of effective space utilization without compromising on the luxuries that can be offered to enhance the customer’s shopping experience. Unlike an online business where the virtual store helps e-shoppers to find the required product just by a click of a button, the brick and mortar business needs to ensure that all merchandizes required by the customers in the locality are to be displayed within the limited space available. Hence the basic principle in running a retail store profitably is to effectively utilize every inch of available space. The higher the number of products that are effectively displayed the higher the customer satisfaction because instead of stopping by at multiple stores, the customer will effectively complete his/her shopping in a single store. In short, “Maximizing the floor space leads to increased sales which in turn mean increased revenue”. This is possible only with the right kind of display store fixtures and a proper store layout within the available space. To understand the importance of corner racks; let’s reason the usage and utility of a corner rack from the point of increased sales potential. Most store fixture suppliers offer regular type of wall racks even at the corner spaces which leads to under-utilization of corner spaces or supply inappropriate corner fixtures leading to mediocre utilization of space. The end result of these not so perfect fixtures at the store corners is that business owners either tend to leave the corner spaces empty or end up stacking all unnecessary products at corners. 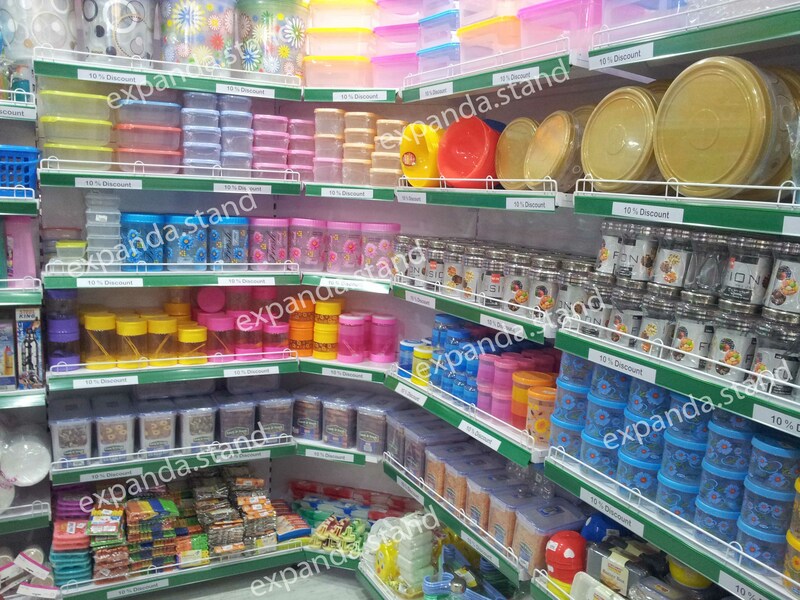 Thus the store loses its appeal and it fails to effectively use its product display space. As the appeal of the store is lost it not only fails to bring in new customers but also fails to retain its regular customers. Ultimately, business owners end up with unsold inventories which were stored at the corners of their store thereby leading to direct cash loss/ revenue loss. In order to effectively utilize such corner spaces for displaying merchandises, you must ideally go for a well-designed corner racks. Distinguish and Sell More: If you plan to promote a particular brand/merchandize, then the corners of the store are the right place for you. The fact that corner racks stand apart from the continuous bays of wall racks, means that customers notice the merchandizes on corner racks more often and effective than those which are placed on a well designed wall rack. This added feature helps them to draw the attention of shoppers which increases the probability of sale. “Madhuusoodhana has a rich experience in designing and developing innovative retail store fixtures with a prime focus on improving supermarket and convenience store shopping experience. His close association with leading retail business owners pan India has helped him to conceptualize ideas to overcome the intricacies faced in displaying products. His experience in store fixture industry adds to his advantage to provide pragmatic solutions which are easy to adapt in almost all the retail environments.